Brutalization of lawyers in Cameroon and the "Anglophone problem"
Police brutality during peaceful protests in Cameroon is an undisputed reality. It happens all the time. Cameroonian police (and sometimes the army) routinely use illegal brute force to crack down on unarmed civilians - usually with absolute impunity. Police brutality in Cameroon has no bounds as it affects everyone, including lawyers - a highly respected group of people in countries where the rule of law prevails. In countries like Cameroon where there is no respect for the rule of law there is equally no respect for lawyers by law enforcement officers who, due to decades of impunity for crimes committed in uniform, think they are above the law and above the people they are meant to serve and protect. For quite some time now lawyers in the English-speaking region of Cameroon have had grievances and have taken peaceful, legal steps to address them. Their grievances include the conception of laws in French, presentation of the laws in parliament in French, promulgation in French and wrong translation of laws into English - which, according to a lawyer speaking to BBC Africa during a demonstration on 23 June 2016, lead to unclear laws and incrimination of anglophones. Lawyers in English-speaking regions of Cameroon believe their "jurisdiction" and "common law principles" are being "invaded." Other grievances voiced during the June protest include opposition to a new law that, among other things, criminalizes non-payment of rents by tenants and grants immunity to government ministers. Under the controversial new law, according to VOA news, tenants who fall behind on their rents by at least two months could be imprisoned for three years. Lawyers in English-speaking parts of Cameroon believe the law is designed to protect the rich and powerful. The controversial bill was passed despite opposition by lawyers. 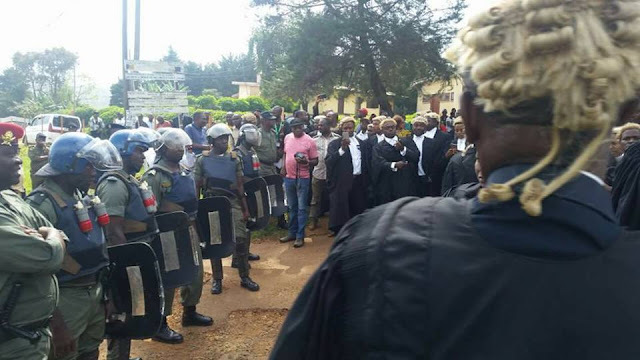 Several months after their voices went unheard lawyers in Bamenda took to the streets again on 8 November 2016 to, once again, voice their grievances. According to the BBC (in French) they demanded that legal texts and laws be translated into English as required by the Constitution. The lawyers gathered in front of the Court of Appeal in Bamenda to announce the creation of a new Bar Association for anglophone lawyers. Security forces intervened as Bobga Harmony, president of the North West Lawyers Association, started explaining the rationale behind the creation of the new Bar Association. At this point the lawyers decided to stage a protest march in the streets. Police used tear gas to disperse them. The BBC reports that since 11 October, anglophone lawyers have been protesting the non-existence of English versions of legal texts, including the "uniform Act" of the Organization for the Harmonization of Business Law in Africa (OHADA), the Inter-African Conference on Insurance Markets (CIMA) code and the Central African Economic and Monetary Community (CEMAC) regulations. Peaceful demonstrations by anglophone lawyers spread to other parts of English-speaking Cameroon. On 10 November 2016 lawyers in Buea in the southwest region demonstrated - voicing same grievances as their colleagues in Bamenda. Protesting lawyers in Buea met with heavy-handed police response. Lawyers were reportedly brutalized, their offices ransacked, and their wigs and gowns seized by police. Many were left injured and bloodied. Lawyers on their way to Buea in cars and taxis were reportedly harassed around Mutengene, Mile 14, Mile 16, Mile 17 and Muea. Lawyers' phones were seized and destroyed, and those heading to Buea on that day were, according to reports, asked to return to where they were coming from. Hotels were reportedly raided by police in search of lawyers, and those lodging in targeted hotels were harassed by so-called law enforcement officers. A video on Facebook shows a disturbing case in which a lawyer was harassed, shoved and pushed to the ground by police officers in riot gear. In the video a female police officer can be clearly heard telling her colleagues, in French, to beat up the lawyer. "Frappe! Frappé lui", she shouts. The incident reportedly took place in Muea in the southwest region. Photos of the incident are available on Facebook. The video in question is also available on YouTube. This episode of police brutality in Cameroon was not limited to lawyers. Teachers and the general public joined the strike. Teachers reportedly oppose what has been described as the "imposition of French in schools in Anglophone parts of the country." Protesting residents voice other grievances, including - according to protest signs - poor roads, no jobs, no water. According to the BBC at least 100 people have been arrested following protests and several people are being treated with bullet wounds in hospitals. Police reportedly used live bullets and one person was reported killed. A Facebook video shows the alleged victim. University students in Buea also bore the brunt of police brutality. Many were molested by police and disturbing videos such as a video showing police officers armed with sticks rolling students in a mud puddle flooded Facebook. In another video police can be seen invading student quarters. In another, state security forces can be seen beating a student. A photo of a student with a bloodied head allegedly inflicted by police in Buea is a familiar sight. Historically, numerous Cameroonian civilians have been beaten, bloodied and killed by police during protests. According to a security message for US citizens released by the US department of State Bureau of Diplomatic Security, the US embassy in Cameroon deferred all non-essential travel for US embassy personnel to the Northwest and Southwest regions of Cameroon from November 21 to 23 as result of planned strikes and demonstrations. An indication of how bad and volatile the situation is. Police brutality is endemic in Cameroon, and impunity for blatant acts of violence committed by so-called law enforcement officers against peaceful protesters is the order of the day. Many of the perpetrators often come across as angry, untrained and corrupt. Impunity for such crimes emboldens perpetrators - many of who think, wrongfully of course, that they are above the law by virtue of being soldiers, gendarmes or police officers. In fact, as sad as this may sound, it is plausible to conclude that given the sorry-state of affairs in Cameroon - police officers in the country are above the law. Numerous peaceful protesters have been killed over the years by state security forces and - to the best of my recollection - no one has ever been brought to justice. In fact, as the recent episode unfolded I spoke with a lawyer who has practiced law in Cameroon for almost 15 years, and he said he could not provide "any jurisprudence" related to police brutality. The state of affairs speaks to two things: Cameroon is either a lawless state, or police officers are above the law. I subscribe to the latter. The fact that this time police officers have gone as far as brutalizing lawyers is an indication of the new-found courage vested in them by many years of impunity for criminal violence committed by police against civilians in Cameroon. Over the past couple of weeks following the demonstration by lawyers, some Cameroonians have questioned whether or not there is an "Anglophone problem" in Cameroon. Some have even raised questions about the definition of an "anglophone." I would like to make it as clear as possible that the way I see it - there is an "anglophone problem" in Cameroon, and the problem goes deeper than anglophones being referred to derogatorily as "les anglos." I do not have to search deep to find reasons to support the claim that there is an anglophone problem. Laws, for example, are conceived in French, debated in French and promulgated in French. The French language, which is now perceived by many English-speaking Cameroonians as the "language of the oppressor" is constantly being used by police and other state authorities to alienate and intimidate English-speaking Cameroonians in offices and public spaces around the country. On the flip side English-speaking Cameroonians in the French side of Cameroon are compelled by circumstances to learn and speak French. Video footage showing a female police officer shouting "frappe! Frappé lui" to her colleagues as they harass a lawyer in Muea is a case in point. It is worthy to mention that some anglophone police officers sometimes use French in order to intimidate and distance themselves from their fellow anglophones. Many of them understand the impact of French on English-speaking Cameroonians. The state of roads in Bamenda also points to a problem. According to a protester speaking from a casket on the roof of car Chinese workers dig roads in Bamenda and break water pipes. When this happens it is the locals that pay for the damage. In another video segment the protester asserts that the things that happen in Bamenda cannot happen in Yaounde, which is the capital and a predominantly French city. I share the view that a Chinese company cannot go to Yaounde (or any major French-speaking city) dig roads, break pipes without consequences. Furthermore, the marginalization of English-speaking Cameroonians is reflected in tiny details that are ignored but go a long way, such the texts on the currency of the country - the Central African CFA franc. A look at an image of the 10000 francs note for example reveals that everything written on it is in French. The same is true for the 2000 francs note, the 1000 francs note, the 500 francs note, just to cite a few. Now, compare that with currencies of other bilingual countries such as the currency of Canada or the currency of Belgium or the currency of Switzerland or the currency of Burundi, just to cite a few. Some supporters of the Cameroonian regime and those who argue that there is no anglophone problem would argue that the CFA franc is in French because it is a common currency shared by six countries in central Africa, namely: Cameroon, Central African Republic, Chad, Republic of the Congo, Equatorial Guinea and Gabon - hence one of them cannot influence the language on the currency. This argument does not hold water. The euro, which is the official currency of the eurozone, is used by 19 countries across Europe -- countries with different languages. The euro however is representative of the countries that use the currency. For example the edges of the Finnish euro coin reads "SUOMI FINLAND" (the name of the country in Finnish and Swedish, the country's two official languages). This is in line with the December 2006 amendment of the euro coin, according to the Bank of Finland. French is the only language on the Central African CFA franc because the countries involved have no regard for minority rights. Some have argued that there is no "anglophone problem" because there are French-speaking Cameroonians who also bear the brunt of the brutal Biya regime that has controlled Cameroon for more than three decades. It is true that there are Francophones who also suffer as a result of bad governance, widespread corruption and impunity orchestrated or condoned by the predominantly French Biya administration but this does not take away anything from the plight of anglophones. According to South African History Online, large sections of white South Africans have lived in poverty for generations. And there are white south Africans living in poverty long after the end of Apartheid. This does not mean there was no discrimination against black South Africans. 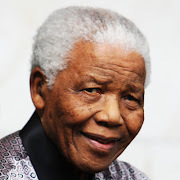 In the South African context, it could be argued that not all white people benefited directly from the Apartheid regime but such an assertion would not delegitimize the struggle of black South Africans. French-speaking Cameroonians make up majority of Cameroon's population. Eight out of ten regions in the country are primarily French-speaking - representing more than eighty percent (80%) of the country's population. The plight of the minority is not dependent on whether or not all of the majority is better off. The "anglophone problem" in Cameroon is complex, and those who raise the issue risk being branded enemies of the state, and persecuted by a repressive regime that has been in power for more than thirty years by way of brutal crackdown on dissent and phony elections. This should not be the case because the problem is real. Not all those who subscribe to the school of thought that there is an Anglophone problem are "secessionists." Many are and many are not. 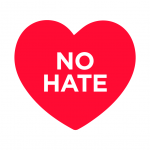 The debate is toxic but the rights and freedoms of people on all sides of the political discourse should be respected. Those who support secession should respect the stance of those who do not, and vice versa. There are no "traitors" - a very strong word commonly used by those who advocate secession to describe those who do not support the cause. Both sides, I think, have the best interest of English-speaking Cameroonians at heart. The only difference lies in approach. More importantly, the state must respect the people's right to freedom of expression and peaceful assembly. Civil dialogue is required in order to arrive at a sustainable solution, which is not necessarily secession. Secession, I believe, should be the last resort. There are bilingual and multilingual countries around the world that are stronger because they are not divided along linguistic lines. All linguistic groups work together, mindful of their rights and duties, to advance the national interest. The issues raised by Cameroon Common Law lawyers - who were later joined by teachers, students and general English-speaking Cameroonian public - are genuine, and many of the problems could be easily solved by good governance - an ingredient lacking in Cameroon under president Paul Biya. A good place to start would be a change in (government) leadership, and the creation of system of government that allows, for example, the election of regional administrators such as governors, Divisional Officers (DOs) and Sub-divisional officers (SDOs). In this way regional administrators would be accountable to the people who elect them - not to the person who appoints them. In addition, election of local administrators would also get rid of "corruption factories" like the National School of Administration and Magistracy known by its French acronym: ENAM - a relic of colonialism created in 1959. While qualified Cameroonians should be free to live and work in any region of the country, French-speaking individuals, including judges and teachers who cannot communicate in English should not be imposed on English-speakers by appointment or presidential decrees, and vice versa. Police brutality will not solve the numerous problems that threaten the existence of the Republic of Cameroon (or la République - as some prefer to call it). Brutal criminal acts by security forces would only further tear the country apart and drive it over a cliff into becoming yet another failed state plagued by civil unrest on the African continent.